The beautiful sound of birdsongs emerging from the trees is a wonderful example of how much nature can still teach us, even as much about their origins are still mysterious to us. About 40 percent of bird species learn to vocalize when they are exposed to a tutor, a behavior of interest to many neurologists and neurobiologists. The other 60 percent can vocalize instinctually in isolation. The variety across species, and the relationship between the nervous system and biomechanics makes birdsong production a complex process to unravel and understand. Physicist Gabriel Mindlin, from the University of Buenos Aires in Argentina, has been looking at the phenomena from what is one of the most unifying and potentially enlightening perspectives of the issue: the dynamical physics of birds' vocal organs. In his recent, in-depth review of the topic, published this week in the journal Chaos, he explores the role of fundamental physics properties in the acoustic complexity of birdsong, and the relationship they have with neural instructions for their production. "My main question was: What part of this complex phenomenon, this complex behavior, is due to the physics and the biomechanisms that [are] involved, and how much is due to the particular neural structures that are controlling it," Mindlin said. "My background is nonlinear dynamics; therefore, I was prepared to accept that many of the complexities of the behavior could be associated to the fact that the vocal device was a nonlinear device and therefore even with simple parameters, you could describe complex behavior." Building on the experimental findings from direct observations—including a study that used a miniature transducer system mounted on a bird's back to measure changes in its lung's air sac pressure—Mindlin looks at the key structural parameters involved the song production. "The songbirds share main features in the way in which they produce their songs, so you can build a unifying model and most of the acoustical differences that they can achieve are due to the region in parameter space where they operate," Mindlin said. "There are some universal features that are preserved across species." From the direct evidence of the acoustics and biomechanics involved, Mindlin and his colleagues built models of this parameter space to describe the precise nonlinear dynamic properties governing the process. Cautious of potential skepticism from the biological community, he also tested the models by recreating songs and using them to study bird reactions in a similar manner to older studies that used actual song recordings. 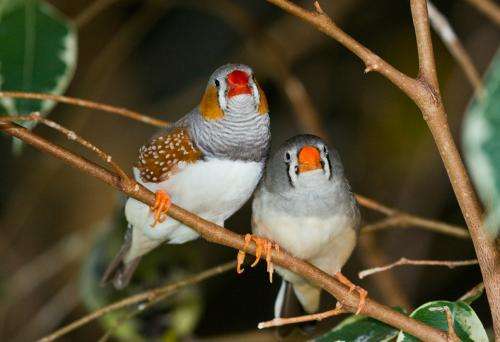 Using synthetic birdsongs, Mindlin and his collaborators were able to recreate much of the neural response in zebra finches that was measured when using recordings of their real songs. These neural signatures, and how they relate to the sound production, offer a lot of insight to the neurobiology of language production as well as, perhaps surprisingly, to more purely fundamental physics. "The interesting thing is that it opens many question for the physics community, how to go from a neuron to the collective activities of muscle fibers and the microscopic control of the biomechanics. It's an open question for out of equilibrium statistical mechanics," Mindlin said.